Milk is the most nourishing of all foods and a favourite drink of people throughout the world. It has almost all the nutrients that people need for growth and good health. Milk has provided nourishment to babies, children, young and old since time immemorial. It is a vital source of calcium, magnesium and phosphorus which calms the nerves, strengthens the heart and all other muscles. Milk, by itself, or in its various forms (e.g. Buttermilk, cream, yoghurt) or in a combination with other things, is an excellent beauty aid. Mix the cream of milk (malai) with a little flour and make it into a smooth paste. Rub this mixture on your face, neck and arms, and keep massaging gently till the flour crumble off leaving the cream only. Pamper yourself occasionally with an exotic milk bath. Heap into a muslin bag a cup of ordinary laundry starch oatmeal and powdered skimmed milk, lower this into the bath water into your bath tub and relax for 10 minutes. Follow by rubbing yourself with the bag for 10 minutes and pat yourself dry. Milk contains the right proportions of fat and moisture to feed and soothe your skin. Pour some milk into a saucer, dip a piece of cotton wool into it and smooth it over your face and neck after washing at bedtime. Pat with a tissue to blot off any excess and then leave it to dry. Milk can also be applied on the scalp and hair for nourishment, especially in cases of dry, brittle or damaged hair. It is a completely natural treatment without any synthetic or chemical additives. Add a cup of cold milk to 20 gm ground almonds stir thoroughly and strain. Apply on face, neck and hands and leave for 20 minutes. Wash off with tepid water. It leaves the skin soft and smooth. Fresh milk cream (1 tbsp), combined with 2 tbsp honey and 2 tsp lemon juice, makes an excellent face mask. To lighten your complexion, take a cup of milk and add a tsp each of honey and orange juice. Wash your face regularly with this mixture- it is a mild bleach. Here is good moisturizing milk for winter- wash 6 strawberries and liquidize till smooth. Add a cup of cold milk and blend till smooth. Add 1 tbsp of glycerine, bottle and refrigerate. Shake the mixture well before use. Milk, particularly buttermilk can be used to combat sunburn. Refer my article on buttermilk. After you boil milk, do not discard the vessel immediately. Scrape the dry milk cream from the sides of the vessel, mix it with a little rose-water and honey and apply all over your face and neck. Leave on for 15 minutes and then rinse with cold water. This is an excellent face tightener. According to a recent report, cloth pads soaked in milk can relieve itching resulting form skin disorders like eczema. 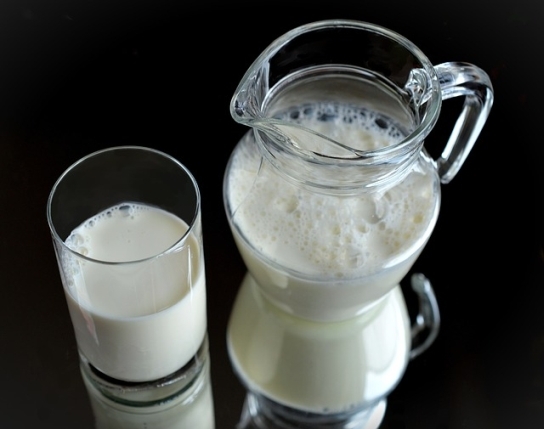 Regular drinking of milk ensures better nails, hair, teeth and skin. A cup of milk at bedtime is said to ensure a good night’s sleep. Milk is nature’s sleeping potion. L-tryptophan, a substance in milk, brings on drowsiness. Freshly ground cinnamon or ginger stirred into hot milk is antiseptic and warming. Milk is good! It gives you calcium and as a young person you need to get all that calcium now! See right now as you drink milk your bones stores up calcium. When you get older it gets harder for your bones to store it. If you don't have enough now then when you are older you might get osteoporosis! Drinking milk will help your child build strong bones and reduce the risk of cavities during their childhood and teen years. During menopause, milk helps to protect women against osteoporosis - in addition to taking other calcium supplements. The body is nourished from inside out thanks to the natural properties contained in milk. For example, milk serves as an excellent moisturizer for dry skin, sensitive skin, and skin injuries. Milk can also help treat serious skin problems such as eczema, psoriasis and rosacea. Milk provides many essential vitamins and nutrients for a balanced diet. Milk contains vitamin B-12, which builds red blood cells that fuel the body with oxygen and nutrients needed for energy production. In addition, milk contains niacin and riboflavin, both responsible for building muscles. I like this article, it has given me a new outlook on drinking milk. I gave up milk a few years ago because I kept hearing how we don't need milk and animals don't drink milk after they are weaned so why should we. Now I'm going to start incorporating it back into my daily diet...Thank you for writing this article. My son LOVES milk so I am glad it's good. When I was growing up milk was promoted as healthy (Milk it does a body good) but lately I hear such mixed things about it. Milk is only good for babies. Are you a baby? If not - quit the milk. Simple as that!!! Try washing your face with warm water and powdered milk. The milk both cleans and moisturizes your skin. milk is a great AHA (lactic acid) treatment which is a great exfoliate and helps minimize wrinkles and dry skin HOWEVER, ladies please read! MILK in the TUB will also cause YEAST INFECTION (too much sugar in Milk for bathing in it) instead, add some (powdered milk ok too) to you r body wash and AVOID the vaginal area, or put some whole milk on a cotton ball and use as a facial cleanser to get youthful, glowing skin without having to buy a $200 cream! Skin Cleanser: Found in ur own kitchen is a simple,chemical free cleanser good unboiled milk.All u need to do is dip a piece of cotton wool in milk & wipe ur face with it.It also cleans unseen dirt & goes down into ur pores.Another fine cleanser is almond oil,especially effective in protecting the delicate skin under the eyes. After childhood humans aren't really meant to drink milk. We are the only mammals that drink milk after infancy and the only to drink milk from another animal! That's why so many people are lactose intolerant, because we aren't meant to consume dairy. So really the only reason to eat cheese or drink milk is if you like it. It is good! It gives you calcium and as a young person you need to get all that calcium now! See right now as you drink milk your bones stores up calcium. When you get older it gets harder for your bones to store it. If you don't have enough now then when you are older you might get osteoporosis! Its calcium content helps to build stronger bones. As you know, nails are a form of bone only. Use a warm cup of milk for strengthening your nails and prevent them from getting chipped-off or broken. After removing your nail polish dip your fingers in a warm cup of milk for 3-5 minutes, and then moisturize the same suitably. Both of the main dairy products that is milk and yogurt can be used as cleanser for oily skin. For yogurt just massage gently over the entire face and wipe away with a towel. Afterward remove any residue with a toner or distilled water. For milk, add some lemon juice and mix well. Now strain and use as a facial cleanser. Both are effective for face treatments. unboiled milk can be used as a facial cleanser,apply it on the face ,let it dry and then wash off with cold water. I mix fresh milk with honey ,make it a paste and then apply it for 20 minutes on my face twice a week! It helps make skin super-soft! But avoid the part around your eyebrows as honey can make hair white! I mix fresh milk with honey ,make it a paste and then apply it for 20 minutes on my face twice a week! It helps make skin super-soft! Try washing your face with warm water and milk. The milk both cleans and moisturizes your skin. Milk contains lactic acid and what this does is act as a gentle exfoliater, removing dead outer skin cells and helping reveal new soft ones. Milk also soothes the skin and is very gentle. using skim milk though is not as useful as the whole fat milk. I do not know if milk is effective at removing make up or dirty oil, but... you could try washing your face with your regular soap or cleanser to remove makeup and excess oil and then wash again using the milk and warm water to soothe your face and give it a "final" treatment. The whole milk has moisturizing properties. And, as long as you rinse thoroughly there should be no "milk odor"
Apply raw milk every day on ur face (morning time) leave it for 15 mnts.then rinse off with cold water. u will find a glowing skin. What does washing your face with milk do for your skin? Milk contains lactic acid and what this does is act as a gentle exfoliater, removing dead outer skin cells and helping reveal new soft ones. Milk also soothes the skin and is very gentle. using skim milk though is not as useful as the whole fat milk. I do not know if milk is effective at removing make up or dirty oil, but... you could try washing your face with your regular soap or cleanser to remove makeup and excess oil and then wash again using the milk and warm water to soothe your face and give it a "final" treatment.The whole milk has moisturizing properties. And, as long as you rinse thoroughly there should be no "milk odor"
Can just using milk on your face be a good facial wash? Milk itself is not enough to help fight break outs, but it does moisturize it and keep it soft and healthy looking. I'm sorry, but you people who say you don't need milk after childhood are ridiculous. Saying that it's not meant for us to ingest after infancy because other mammals don't, is like telling us that we shouldn't cook our meat, we should just eat It raw, because no other mammals besides us cook their meat before they eat it. If we weren't at all meant to drink milk after childhood then I should probably be dead right now! makes your skin as soft as a baby's. I have read that milk regulates cellular metabolism, activates proteins synthesis, anti oxidant enhanced for smooth skin appearance. It stimulates the synthesis of anchoring molecules such as collagen and you’ll have a great foundation for creams. Pour a little honey into the palm of your hand and add some whole milk powder, mixing to form a gel. Use as you would any shower gel. It’s guaranteed to leave your skin feeling silky soft and smooth! To a warm bath, add 2 drops lavender oil, 1 tablespoon honey, and 2 tablespoons whole milk powder (or 1 cup liquid whole milk). Soak as long as you like, then shower to remove all traces of milk and honey. You could also use 1 cup of instant whole milk, instead of liquid milk. Try it out and feel like cool Cleo! Use whole milk, applying gently to face and then rinse thoroughly with water. Milk is a luxuriant skin treatment when it is added to bath water. Milk exfoliates, softens and nourishes the skin. There are several ways to enjoy a milk bath. Remember to add essential oils to your milk bath. You can use lavender and vanilla to relax in a warm organic goat's milk bath or you can try sweet orange oil to energize yourself. Either way milk baths are nourishing and offer the healthiest softest skin possible. After your bath you can apply goat's milk lotion for deeply moisturized vibrant skin. A milk bath is definitely on top of my options for unwinding and relaxation. Most of my Me-Time are spent in such. It does not only relaxes me but is also good for the skin. Milk actually been proven to be an affective skin cleanser. Many cleansers have the same nutrients that milk does. It get's into your pores and makes them stonger and healthier. It's very normal, but if you have acne, it's known to make it worse. So go on using it, it's great for your skin! It not only soften ur skin but it work on melanin specially if its used with lemon juice or raw milk as soon as its been taken from cow. still u can use the one found in supermarkets. trick is to first cleanse ur skin with milk at least twice a day then apply it on ur face or wherever u want with ur own hand or cotton bud leave it for ten mins atleast then wash with water . don't use soap or anything. gram flour mixed with turmeric powder a little of it along with ground almonds and milk , rosewater etc. use it as scrub and mask. use it for at least a month to see results. use good sunblock or avoid direct exposure to sun. do let me know how it worked for u. u can also eat certain food to purify ur blood and drink plenty of water just to flush out whole of ur system specially skin. also make sure ur hemoglobin is adequate so u can look fair and pink. serves as an excellent source of calcium that makes our bones and teeth strong.it provides the body with high quality proteins that contain the essential amino acids, which the body is incapable of producing by itself.Milk also helps in meeting the body's requirement for vitamins. Boiled milk along with fresh lime juice can also be used for treating pimples. Wash your face with this mixture every day to get rid of the infectious bacteria that cause pimples. Milk is a natural skin whitener. are you sure i can use spoiled milk? @Anon (comment #59): Why do you want to use spoiled milk? If at all, your milk gets spoiled, there is no harm in using it on your skin.